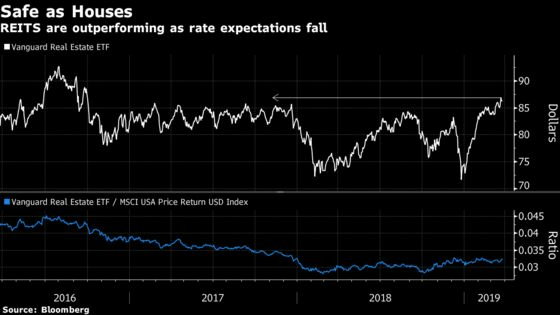 (Bloomberg) -- The investing landscape for stocks acutely sensitive to the ebbs and flows of global bond markets is fast changing as investors bet the monetary hiking cycle across America and Europe is no more. Newfound darlings in the lower-for-longer era are companies dangling steady payouts across consumer staples, real estate and utilities, while financial shares take a hit as gyrations in yield curves vex the economics of lending. All told, the bond rally fueled by the Federal Reserve’s dovish capitulation is spurring a fresh wave of sector rotations -- and angst as bonds flash recession fears. 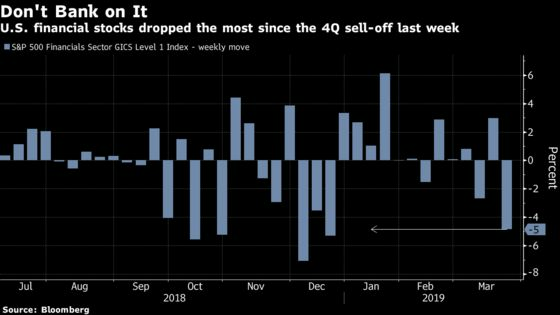 Bond proxies have proved ports in the storm as cyclical equities that have led the global rally succumb to growth fears. 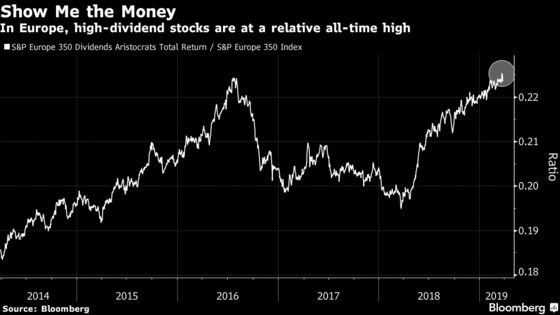 So-called dividend aristocrats in Europe have hit an all-time high relative to the broader market. With 10-year bund yields trading in negative territory, Barclays Plc upgraded the real estate and utility sectors in Europe this week as it downgraded financials and fretted the outlook for riskier shares. “Lower-for-longer yields are problematic for risk and banks in particular,” strategists led by Emmanuel Cau wrote. Over in the U.S., companies with generous payouts, which include storied names like McDonald’s Corp., AT&T Inc and Coca-Cola Co., are morphing from laggards to outperformers. The Vanguard Real Estate exchange-traded fund, which tracks REITs, a decidedly income-rich sector, is near the highest since 2016. 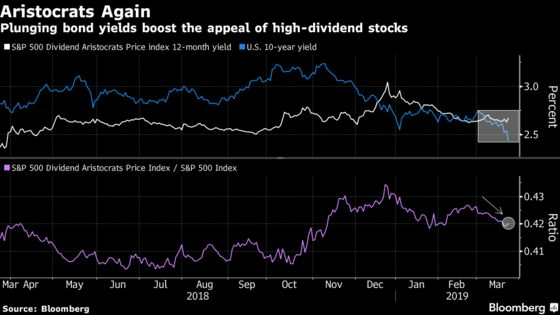 As investors hunt for growth companies famed for ginning up reliable profits late in the business cycle, the latest downslide in yields is dashing hopes of a tentative rebound in value investing -- even as the valuation gulf between the cheapest and priciest companies hits historic extremes. With pockets of the U.S. curve signaling an economic slowdown, cyclical sectors such as financials that tend to be classed as value shares are in the firing line. Ultra-low yields are also reducing the opportunity cost of holding high-duration assets like technology companies that promise earnings expansion over the long haul -- raising the bar for cheaper equities to outperform. 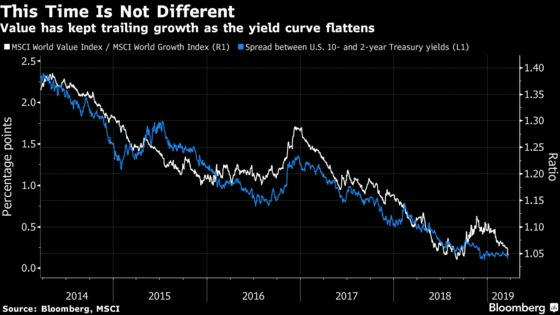 “Until there is a decisive steepening of the yield curve, we think the wait for value’s recovery will continue,” Nomura strategists led by Joseph Mezrich wrote in a note. 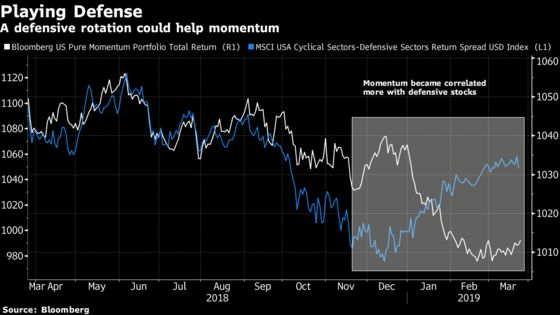 For quants besieged by choppy trends of late, it’s all raising a tantalizing prospect that bidding up the new stock winners while snubbing the losers, known as momentum investing, may get a lucky break. The investing style has underperformed in the new-year rally as it became correlated with defensive shares such as utilities. Now, the recent resurgence of the sector amid economic anxiety is lifting the automated strategy from its trough. Bond proxies are at the mercy from a breakout in yields from ultra-lows, of course. Over at Wells Fargo Asset, Jacobsen urges “caution in getting too cautious.” Defensive sectors are sensitive to any rebound in bond yields, which may occur as the economic outlook is still constructive, he said. Having scaled down on financial stocks and snapped up utilities earlier in the year, Simon Wiersma also urges vigilance.